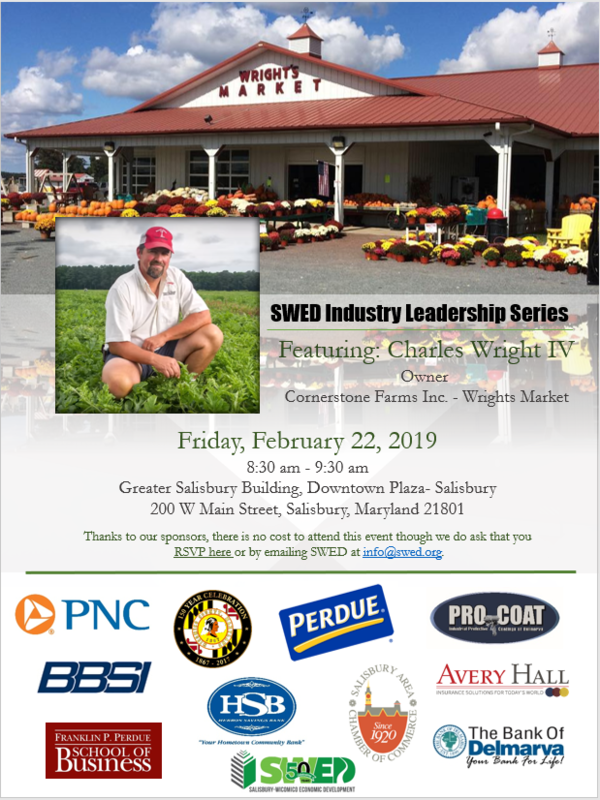 Join us on Friday, February 22nd 8:30 to 9:30 am at the Greater Salisbury Building, for our Industry Leadership Series event featuring Charles Wright IV, Owner of Cornerstone Farms and President of the Wicomico County Farm Bureau. Thanks to our sponsors this is a free event though we do ask that you RSVP here. 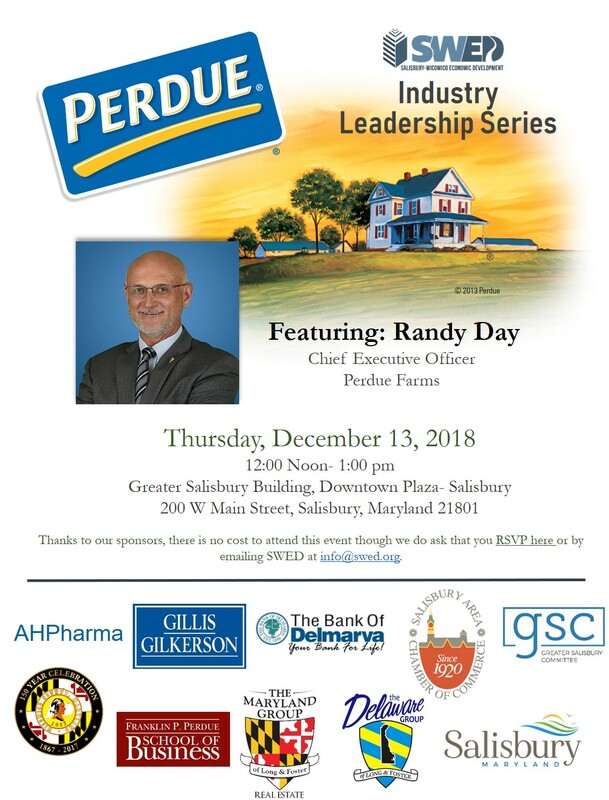 Join us on Thursday, December 13th 12:00 to 1:00 pm at Greater Salisbury Building, for our Industry Leadership Series event featuring Randy Day, Chief Executive Officer of Perdue Farms. 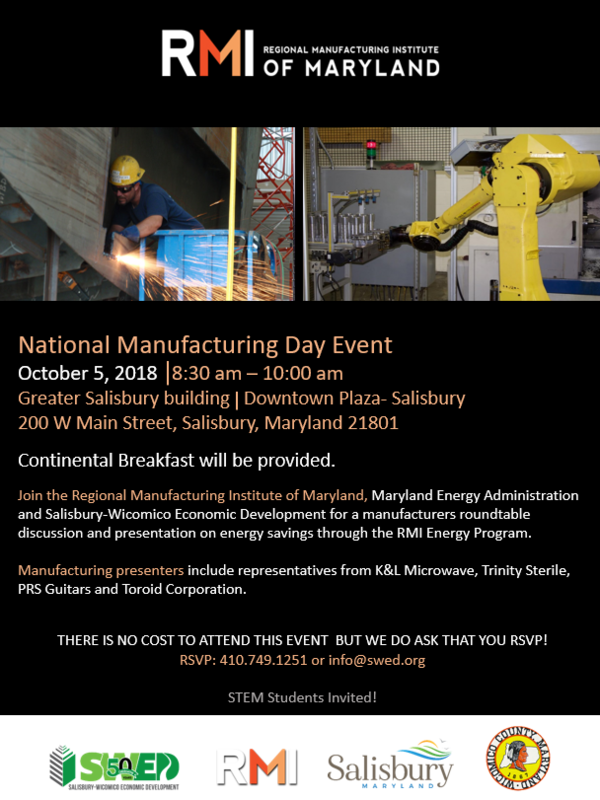 Join us on Friday, October 5th, 8:30 to 10:00 am at Greater Salisbury Building, for a manufacturer round table discussion and presentation on energy savings through the RMI Energy Program. This is a free event though we do ask that you RSVP here. 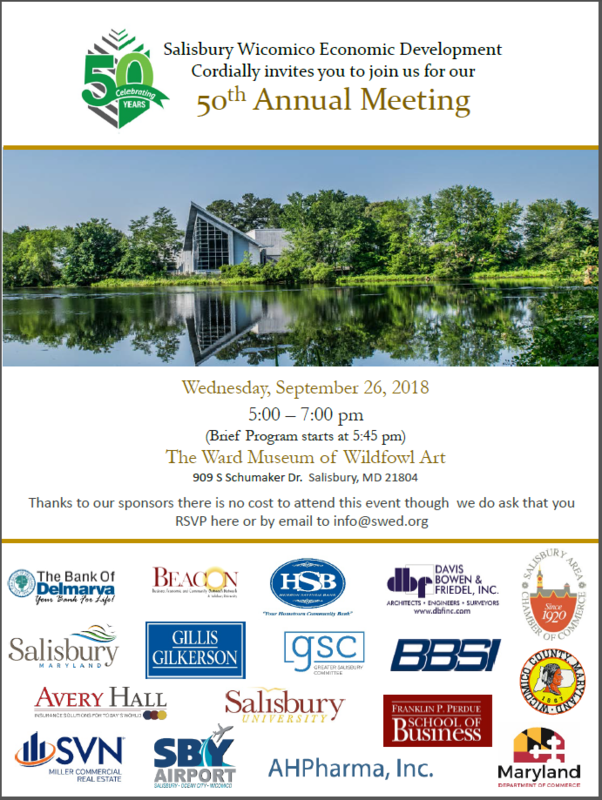 Join us on Wednesday, September 26th for our 5oth Annual Meeting and help us celebrate fifty years of Economic Development, recognize our Past Presidents, elect new officers and much more. 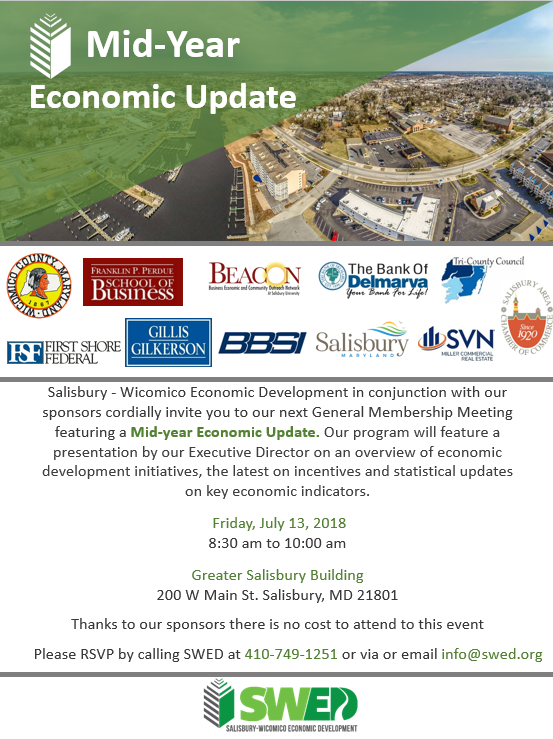 Join us on Friday, July 13, 2018 from 8:30 to 10:00 am at the Greater Salisbury Building for our next General Membership meeting featuring a presentation by our Executive Director on an overview of economic development initiatives, the latest on incentives and statistical updates on key economic indicators. 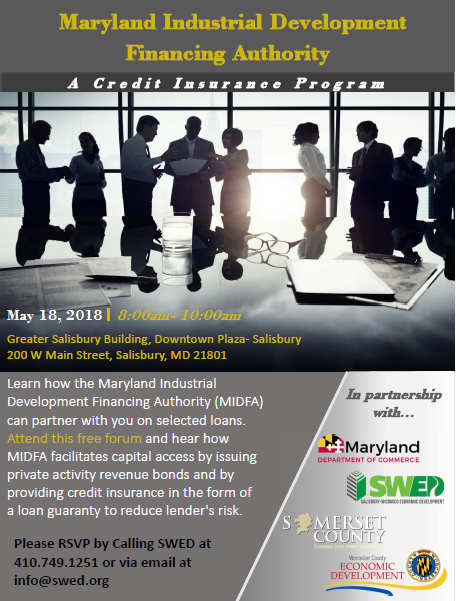 Join us on Friday, May 18th, 8:00 to 10:00 am at Greater Salisbury Building, to learn how MIDFA can partner with you on selected loans. 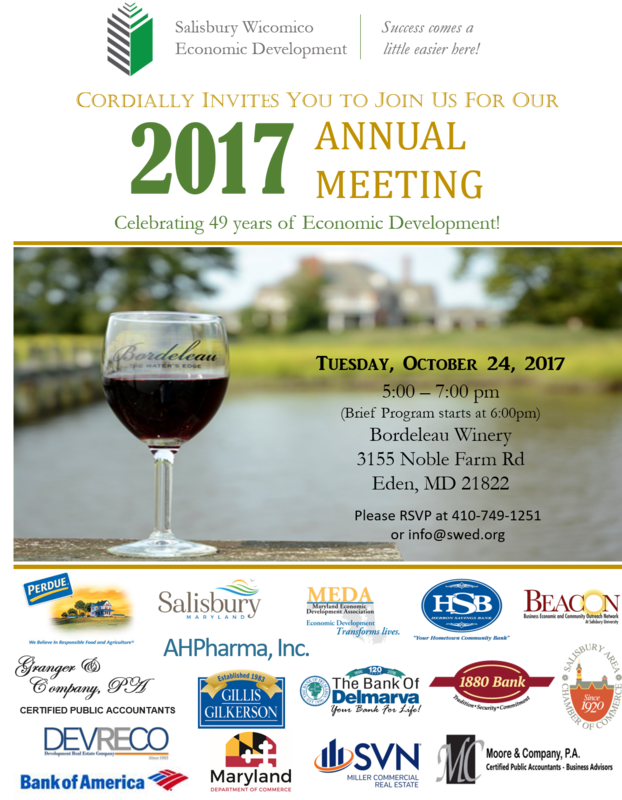 Join us on Tuesday, October 24th, 5:00 to 7:00 pm at Bordeleau: The Water’s Edge Vineyard and Winery as we celebrate our 49th year of operations. We’ll release our 4th video highlighting agriculture in our community and region, and much more. Thanks to the generosity of our sponsors, this is a free event though we do ask that you RSVP here. 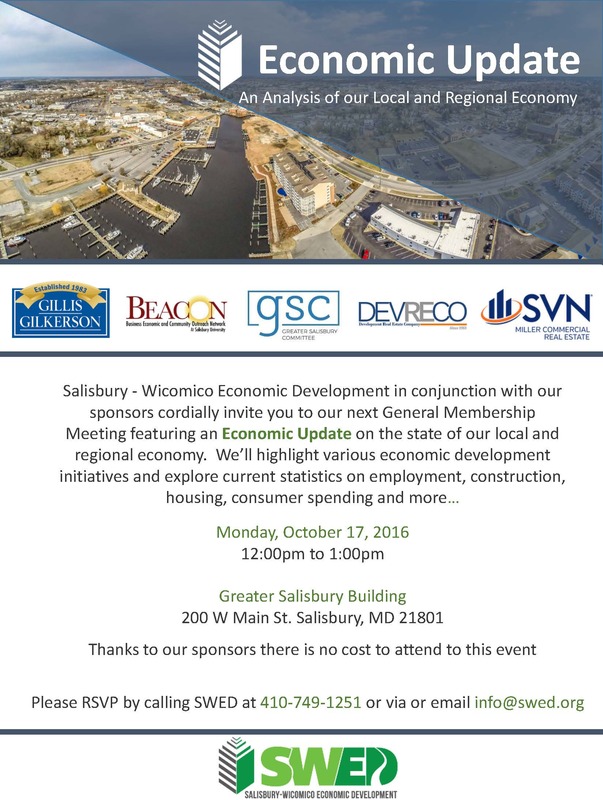 Join us on Thursday, June 22nd at the Greater Salisbury Building’s second floor conference room from 12:00 – 1:00 pm. 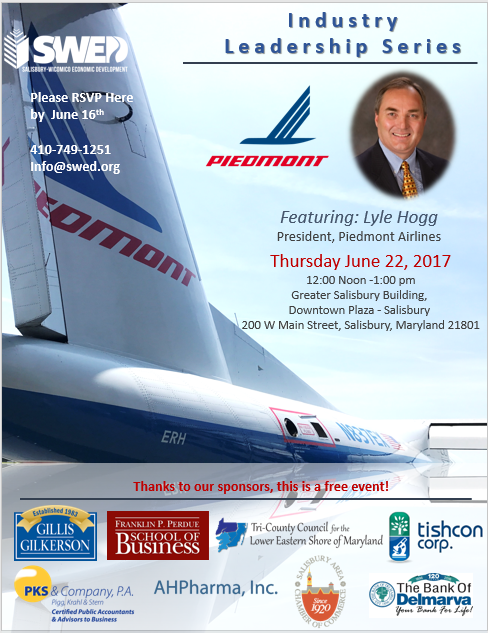 Our program will feature a presentation from Lyle Hogg, President of Piedmont Airlines. Lunch will be provided thanks to the generosity of our sponsors though we do request you RSVP here. Join us on Wednesday, November 16th as we celebrate our 48th year of operations. 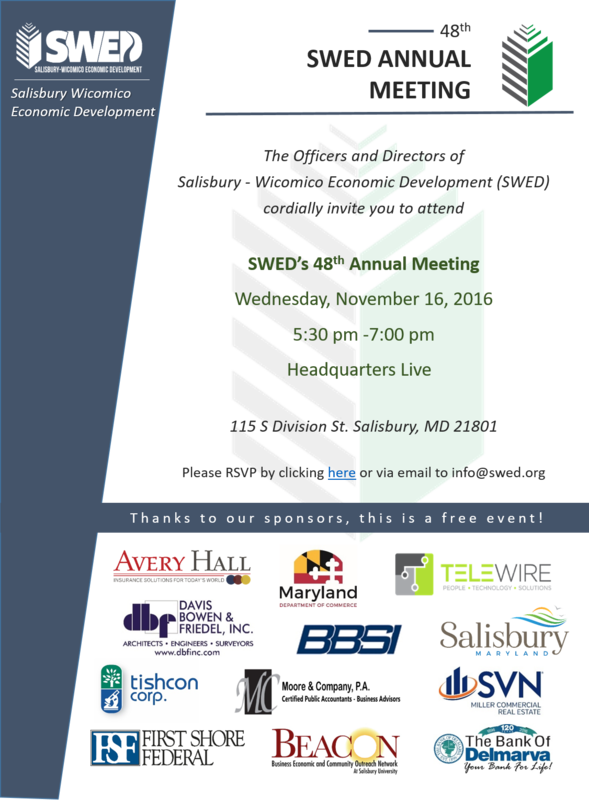 We’ll recap our past year, elect new officers, release our 3rd video highlighting agriculture in our community and region, and much more. Thanks to the generosity of our sponsors, this is a free event though we do ask that you RSVP here. AHPharma was founded in 2006 by Dr. James McNaughton with the mission of providing contractual research that generates capital and increases the core business, inclusive of design, development, marketing and production of new patented technologies in the public food safety arena. 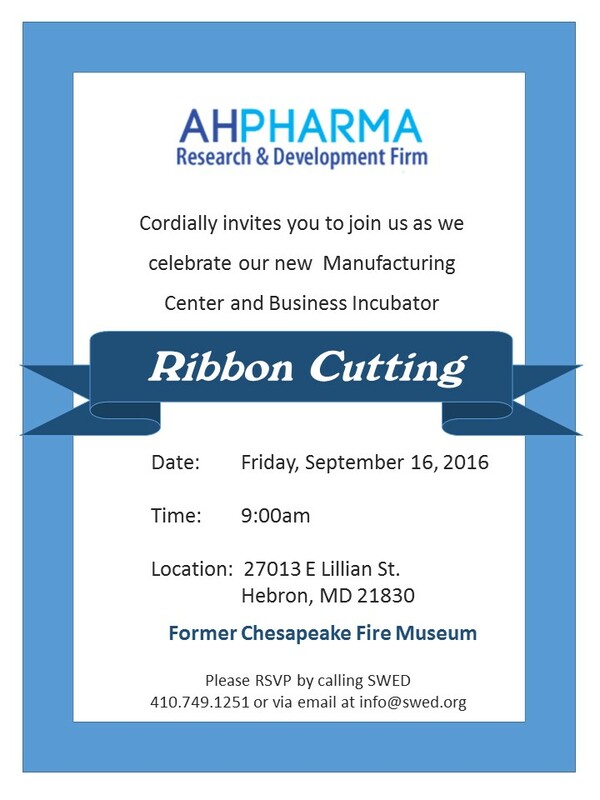 AHPharma acquired a new facility in Hebron MD in 2016 to establish a manufacturing and business incubation center where entrepreneurial and innovative firms can locate and collaborate on new market opportunities. 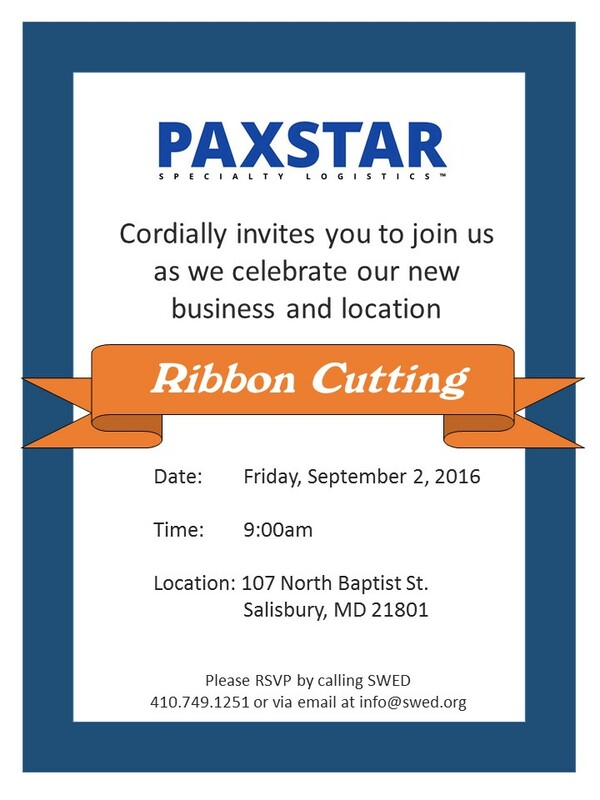 Paxstar Specialty Logistics is a contract service provider to a wide range of clients within the logistics industry. With extensive knowledge of stringent transportation requirements, Paxstar offers temperature validated shipping solutions, dual driver protective services, extensive regulatory reporting and much more to clients within the pharmaceutical, medical device, biotechnology, retail and government industry sectors. Our “Connections” forum will focus on identifying and highlighting resources available to connect people to job and training opportunities. Thanks to the generosity of our sponsors, this is a free event. 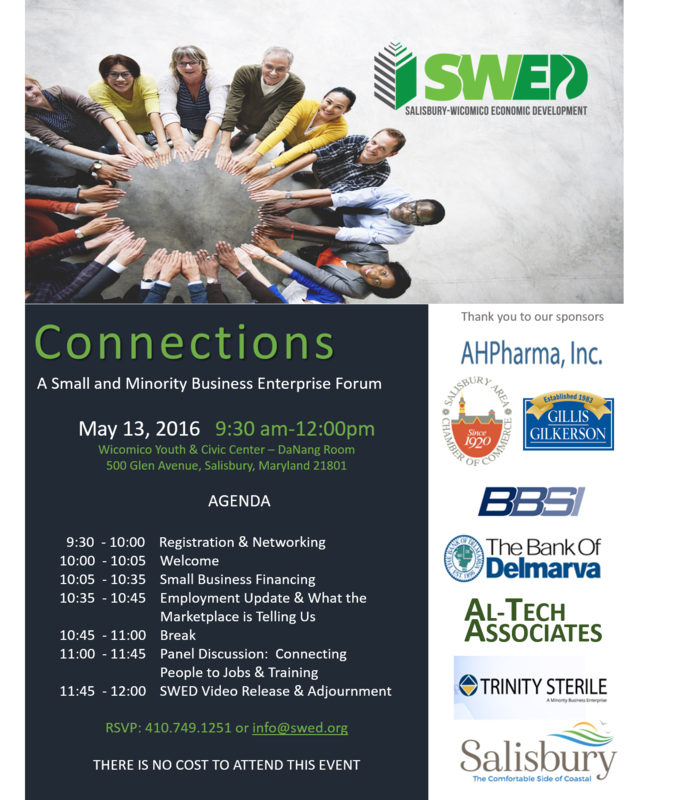 In addition to the forum, SWED will release its second video in a series of videos promoting our community as a great place to live and work. 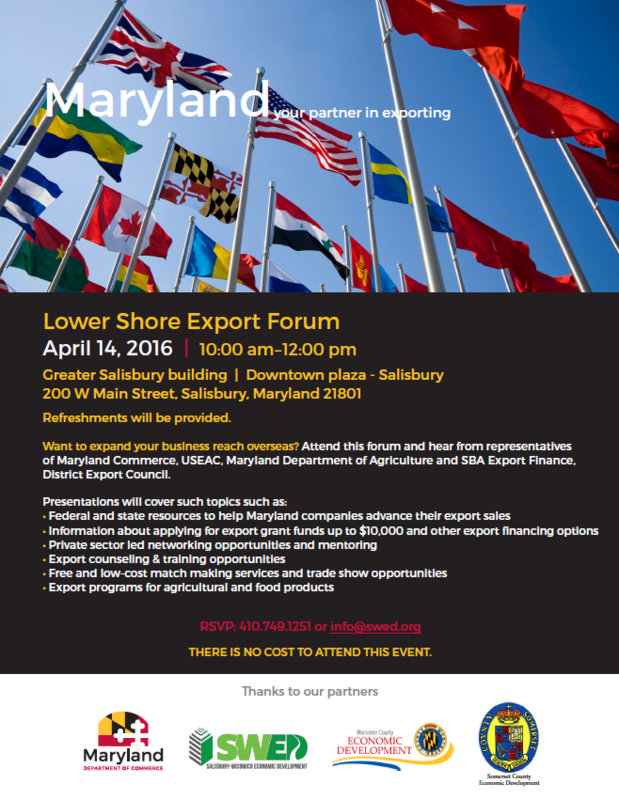 We are hosting a Lower Shore Export Forum on Thursday April 14. This program helps companies explore state and federal resources available to help market products and services internationally. Part of the resource available include potential grant funding for trade show participation. There is no cost to attend.